So many odd advertisements appear in the pages of old magazines, quaint and strange to our twenty-first-century eyes. How about Educator Crackers? They were invented by a New England dentist during the 1880s. After three decades of practicing dentistry with a foot-treadle drill in a dark office, he could not bear the sight of his patients’ rotten teeth. Around the same time, an unsmiling man named Horace Fletcher was running around the country promoting “Fletcherism,” the practice of masticating food until it just ran down one’s throat. 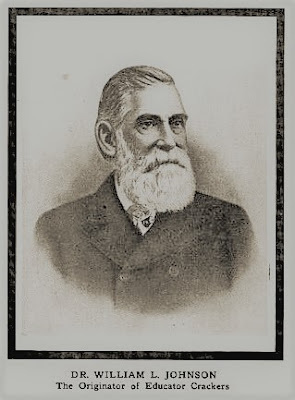 The dentist, William L. Johnson, drew inspiration from Fletcher. He decided that Americans’ teeth were being ruined by too much soft food, especially easily-downed crackers made of white flour. He devised a new recipe whose ingredients were whole wheat flour and water, and which would require a great deal of chewing. 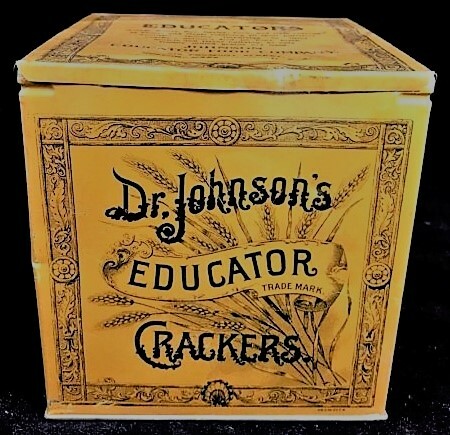 Dr. Johnson’s family baked the crackers at home and he gave them away to his patients. The dentist named them “Educator Crackers” because he hoped to educate people about nutrition and diet. Within a year, the crackers became so popular that he started to think about giving up dentistry and going into business. But it was 1885, he had reached the age of 60, and he just wasn’t sure about entering a new profession. So Dr. Johnson asked his daughter, Nora Bird, for help. Twenty-five years old, ensconced in a Victorian household, she saw an opportunity for herself and her father. At Nora’s urging, Dr. Johnson established the Educator Cracker Company and opened a store on Boylston Street in Boston. The store did well. As demand increased, the company contracted with Butler’s Bakery of Newburyport, Mass., to manufacture the crackers. This made sense because Butler’s had been supplying hardtack (also known as pilot’s bread) to sailing ships since the eighteenth century. In 1895 Nora Bird married a linotype operator from Maine, name of Frederick Barbour. He soon joined his wife and father-in-law in the business and became its treasurer. One year later, the company introduced three new cracker varieties: rye, graham and corn meal . . . not very exciting. My hunch is that Dr. Johnson resisted expansion, but Nora kept hoping for something bigger. and many more new types of Educator Crackers. The company’s Educator Ark, filled with animal Educator Crackers, sold out every Christmas. And in 1913, along came the Suffragette Biscuit. Nora belonged in the twentieth century. She had a great imagination as well as a strong grasp of marketing at a time when most food manufacturers were just catching on. Her promotional and advertising campaigns were often cited in trade journals of the day. In 1919, Nora and Frederick sold their controlling interest in the company. Thereafter it changed hands and names several times before disappearing in 2001. 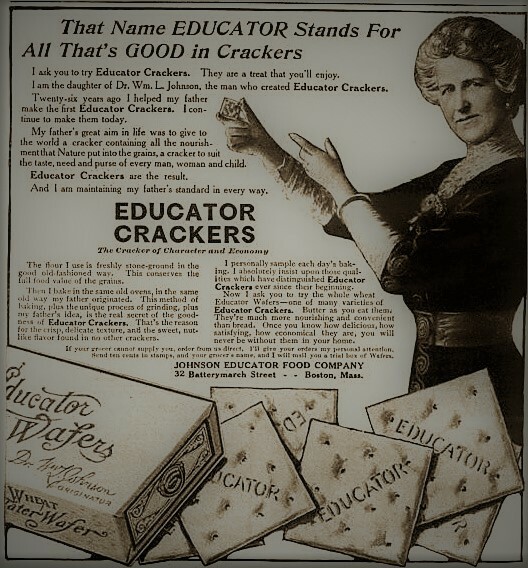 That name – Educator Crackers – what a handicap! 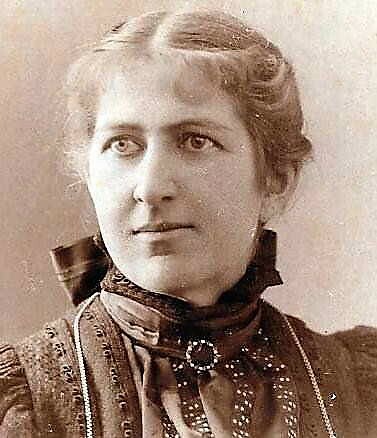 Yet Nora Bird Barbour brought her product to every household in America. That’s why she shines like a beacon through America’s retail past, an unsung daughter of Yankee enterprise. *Nora died in 1946. Frederick died in 1926. I love "Suffragette Biscuits." I think we need to bring them back! I would be curious to know what happened to the Barbour money. Whether it established one of those "fine New England families" - that you still see intermarrying in the wedding pages of the New York Times.